Mark your calendars and plan to attend Open House on Sunday, January 27th! If your family brings a prospective family to Open House, your children will receive a FREE DRESS PASS! Start brainstorming who you can invite so you can show off our amazing school. Rita’s Italian Ice will serving their delicious Italian ice throughout Open House, with favors such as mango, cherry and cotton candy! For planning purposes, we have created a Google Sheet for prospective families of currently enrolled students. If you have a child who you are interested in enrolling for the 2019-2020 school year, please add his/her information HERE. Packets can be picked up in the office beginning on Monday, January 14th. They will also be available at Open House. If you have not picked up your TWO Washington DC Raffle Tickets, please do so as soon as possible. This is a mandatory fundraiser for all families (TK – 8). All ticket stubs and money are due by January 23rd at 3:00 PM to the Front Office. The $10,000 raffle ticket winner will be pulled on live Broadcast during Open House at 11:00 AM! 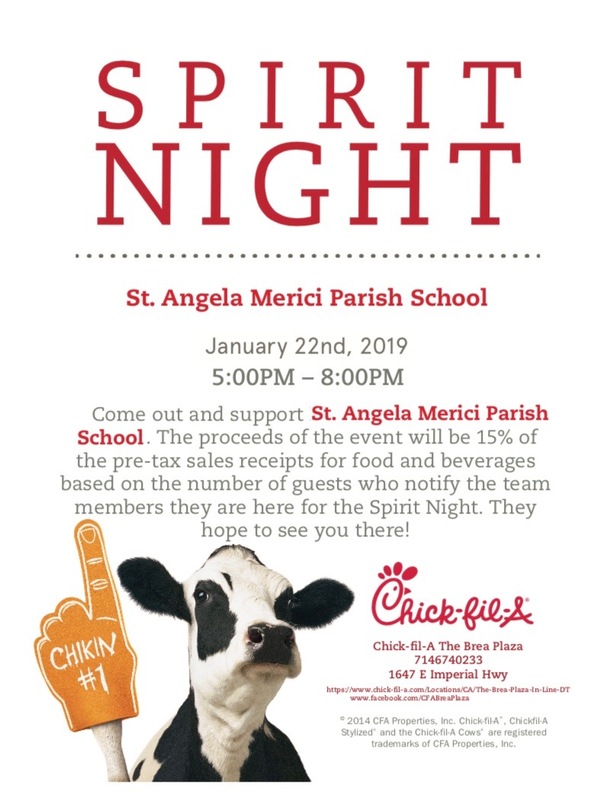 St. Angela Merici Parish School will be having a Spirit Night fundraiser at Chick-fil-A of Brea on January 22nd, from 5:00 – 8:00 PM! Our school will earn 15% of the funds brought in by participants who notify their cashier that they are supporting St. Angela Merici Parish School. We hope to see you there! Thank you in advance to all of our presenters! Our annual Talent Show will be held on Friday, February 1st at 1:00 PM in the Boys and Girls Club Gym. To sign-up, click the link HERE. If your performance uses recorded music, please email music as an MP3 to Ms. Nina at gro.a1555997685erbal1555997685egnat1555997685s@ren1555997685tragm1555997685uabn1555997685" >gro.a1555997685erbal1555997685egnat1555997685s@ren1555997685tragm1555997685uabn1555997685. All music and sign-ups are due by Tuesday, January 29th. We wanted to make you aware that due to unforeseen software delays, our Book Fair will not be receiving the latest version of Scholastic’s EasyScan registers. This means that eWallet will not be available for use during the Book Fair; please do not register for eWallet. Scholastic will still be providing the best experience for our Book Fair! Volunteering positions are now open for the Book Fair! You can sign up by clicking the link HERE. You can volunteer between January 27th through February 1st. Beginning January 28th, those who use Remind will no receive messages if they have Verizon Wireless as their phone carrier. To make sure the St. Angela Merici community continue to receives Remind messages, all those who have Verizon Wireless need to download the mobile app or enable email notifications. For more detailed information about why Verizon Wireless users will no longer receive Remind messages, visit this link HERE. 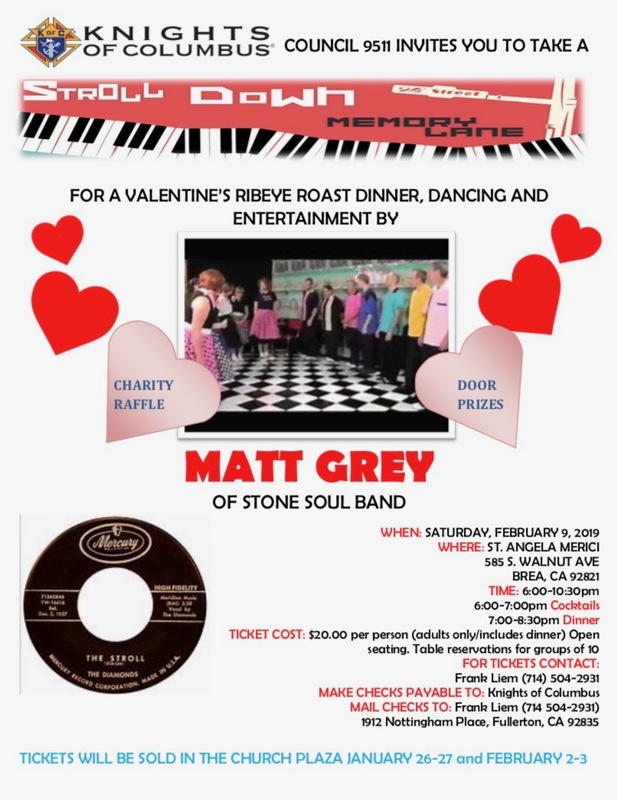 The Knights of Columbus invite you to a Valentine’s ribeye roast dinner, dancing and entertainment by Matt Grey of Stone Soul Band on Saturday, February 9th at 6:00 – 10:30 PM. For more information, check out their flyer! The Boys and Girls Club of Brea will be hosting a Girls Basketball Night tomorrow, Friday, from 5:00 – 6:30 PM. It is free for club members (which all of our students are) and $5 for non-members. All ages are welcome and skill workouts will include ball handling, shooting, footwork, conditioning teamwork and more. Please bring a basketball if possible. Class of 2017 alumni Matthew Remley is currently fundraising for his Eagle Project- a prayer garden for our Church dedicated to Mrs. Kelley Glidewell. The garden will be located on a lot near the southwest corner of the Church property. For more information or if you would like to make a donation, you can visit Matthew’s website by clicking the link HERE. The yearbook and yearbook ad sales are done entirely online again this year, saving you the hassle of paperwork and checks! Yearbook ad orders must be completed by February 16th and yearbook orders must be completed by February 28th. Full-page ads are reserved for 8th graders and half-page ads are available for all students. To purchase your yearbook, visit this link HERE. To purchase an ad, visit this link HERE. We need to remind our school community to practice safe driving. Speeding through morning carline has become an increasingly dangerous issue among the several other unsafe driving practices we have observed lately, such speeding through the residential area around our school, distracted drivers, drivers unsafely blocking traffic and more. Not only do we observe these dangerous practices occurring on almost a daily basis, but we have received several complaints from individuals who live nearby our school. There are reduced speeds in school zones and residential areas for a reason. Failure to follow the California driving laws, especially in areas of reduced speeds, will result in serious and sometimes fatal consequences. If you need a reminder on California driving laws specific to speed in a school zone or residential area, click the link HERE. If you would like more information on the dangers and consequences of distracted driving, click the link HERE. If you need information about pedestrian safety, click the link HERE. Most importantly, click on this LINK to learn how to drive safely around schools. Email all information to gro.a1555997685erbal1555997685egnat1555997685s@nay1555997685rj1555997685" >gro.a1555997685erbal1555997685egnat1555997685s@nay1555997685rj1555997685 (cc: gro.a1555997685erbal1555997685egnat1555997685s@aip1555997685atj1555997685" >gro.a1555997685erbal1555997685egnat1555997685s@aip1555997685atj1555997685) by Wednesday afternoon.